Hi. Thanks for looking at the Park’s water system. As the Park’s Press Director, let me make a few corrections/points: The switch from the well to city water wasn’t made because city water is cheaper/free. The old well took water out of the Brooklyn aquifer. Over time, with thousands of old Brooklyn homes, factories – and the Park – using well water, the ph balance of the water began to change to the point is was detrimental to the Park’s plants and trees. So too, the well was driven by a coal-fired plant that belched sooty smoke into the air. SO when the city’s waterline reached this part of Brooklyn, the decision was made to connect the park to the system. Moreover, the amount of water coming into the Park is regulated depending on rainfall and snowfall. So it’s not as if the water gushes without control. Most importantly, the city water used in the Park’s 60 acre watercourse pays for itself many times over when you consider how much the parks thousands of trees cool the area — 526 acres in central Brooklyn are green thanks to the water, rather than hot asphalt. So too, more than 200 bird species now live/visit the Park because of the watercourse and the plants it support (The Ntl Audubon society has designated the Park an important location on the Atlantic bird migration flyway). Finally the Park’s 526 acres (including the40-acre lake) catch thousands and thousands of gallons of rain water which otherwise would be added to the already stressed storm runoff sewer system. Mixed with the clean city water, the rain water supports a wonderful eco-system which includes the greatest concentration (per acre of water) of largemouth bass in NY State. 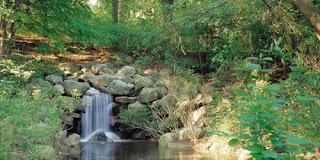 Rather than wasting water, Prospect Park is a model of environmental conservation within a dense urban area. Thank you so much for taking the time to comment on our blog. Let me start my response by saying how much I love Prospect Park. I work six blocks from the park and often bike through it during the summer to get to and from work. Prospect Park is a huge part of what makes Brooklyn and the rest of New York City as great as it and a lot of it has to do with what you said.